The angiogenic activity of CXC-ELR+ chemokines, including CXCL8/IL-8, CXCL1/macrophage inflammatory protein-2 (MIP-2), and CXCL1/growth-related oncogene-α in the Matrigel sponge angiogenesis assay in vivo, is strictly neutrophil dependent, as neutrophil depletion of the animals completely abrogates the angiogenic response. In this study, we demonstrate that mice deficient in the src family kinases, Hck and Fgr (hck−/−fgr−/−), are unable to develop an angiogenic response to CXCL1/MIP-2, although they respond normally to vascular endothelial growth factor-A (VEGF-A). Histological examination of the CXCL1/MIP-2-containing Matrigel implants isolated from wild-type or hck−/−fgr−/− mice showed the presence of an extensive neutrophil infiltrate, excluding a defective neutrophil recruitment into the Matrigel sponges. Accordingly, neutrophils from hck−/−fgr−/− mice normally migrated and released gelatinase B in response to CXCL1/MIP-2 in vitro, similarly to wild-type neutrophils. However, unlike wild-type neutrophils, those from hck−/−fgr−/− mice were completely unable to release VEGF-A upon stimulation with CXCL1/MIP-2. Furthermore, neutralizing anti-VEGF-A Abs abrogated the angiogenic response to CXCL1/MIP-2 in wild-type mice and CXCL1/MIP-2 induced angiogenesis in the chick embryo chorioallantoic membrane assay, indicating that neutrophil-derived VEGF-A is a major mediator of CXCL1/MIP-2-induced angiogenesis. Finally, in vitro kinase assays confirmed that CXCL1/MIP-2 activates Hck and Fgr in murine neutrophils. Taken together, these data demonstrate that CXCL1/MIP-2 leads to recruitment of neutrophils that, in turn, release biologically active VEGF-A, resulting in angiogenesis in vivo. Our observations delineate a novel mechanism by which CXCL1/MIP-2 induces neutrophil-dependent angiogenesis in vivo. Angiogenesis consists in the formation of new capillaries from preexisting blood vessels and is a well-known end point in chronic inflammatory diseases and in tumor progression (1). It is well accepted that several members of the CXC chemokine subfamily, in particular the chemokines characterized by an ELR motif such as human CXCL1/growth-related oncogene (GRO),4 CXCL6/granulocyte chemotactic protein (GCP)-2, CXCL8/IL-8, and the murine analog, CXCL1/macrophage inflammatory protein-2 (MIP-2), induce angiogenesis in vitro and in vivo (2). The CXC-ELR+ chemokines all bind to and activate the chemokine receptor CXCR2, which is considered the key receptor in the angiogenic reaction mediated by these ligands (3). Although the mechanisms through which CXC-ELR+ chemokines induce angiogenesis have not been yet completely clarified, it is well known that they are potently active on neutrophils (4), inducing a marked recruitment of these cells into inflammatory sites. Recent studies have greatly extended our knowledge on the functional role of neutrophils to aspects that go beyond their primary role in clearing bacterial infections (5). For instance, a number of studies have demonstrated that neutrophils can synthesize and store molecules with known angiogenic activity, including vascular endothelium growth factor (VEGF-A) (6, 7), CXCL8/IL-8 (5), CXCL1/GRO (5), and hepatocyte growth factor (8, 9). In this context, recent data clearly suggest that neutrophils can play a key role in the angiogenic process induced by CXC-ELR+ chemokines. We observed that the angiogenic activity of CXCL8/IL-8, CXCL1/GRO, and CXCL1/MIP-2 in the Matrigel plug angiogenesis assay in vivo appears to be neutrophil dependent, as neutrophil depletion of these animals completely abrogated the angiogenic response (10). However, the mechanisms through which neutrophils induce neovascularization in this model have not been elucidated. To clarify the role of neutrophils in CXCL1/MIP-2-induced angiogenesis and to identify factors mediating this activity, we examined the angiogenic response in mice with a single or the double deficiency in Hck and Fgr. Fgr and Hck are two src family protein tyrosine kinases expressed in terminally differentiated myelomonocytic cells (granulocytes and monocytes/macrophages) that have been implicated in regulation of selective phagocyte responses (11). For instance, neutrophils isolated from hck−/−fgr−/− mice display defective adhesion to extracellular matrix proteins, degranulation, and respiratory burst activity (12, 13, 14). Additionally, in models of inflammation in vivo, hck−/−fgr−/− mice were shown to have alterations in accumulation of granulocytes in inflammatory sites. In fact, the enhanced resistance of hck−/−fgr−/− mice to endotoxic shock correlated with a reduced capacity of neutrophils to infiltrate the liver (15), and in a model of allergic lung inflammation, fgr−/− mice failed to develop lung eosinophilia in response to repeated challenge with aerosolized OVA (16). It is important to note that recent studies implicated Hck and Fgr in signal transduction by chemoattractants, including chemokines. For example, the neutrophil degranulation response to the fMLP is defective in hck−/−fgr−/− neutrophils (14) and signal transduction by CXCL8/IL-8 has been reported to involve Fgr and Hck (17). In this report, we demonstrate that hck−/−fgr−/− mice, while showing normal vascularization in response to VEGF-A, are unable to mount an angiogenic response to CXCL1/MIP-2 in vivo due to the inability of their neutrophils to release VEGF-A upon CXCL1/MIP-2 stimulation. These findings add ground to the emerging notion that an interference with neutrophil functions may represent a new facet in the regulation and control of angiogenesis. Eight- to 10-wk-old male wild-type mice (C57BL/6J) and single and/or double hck−/−fgr−/− mice used in these studies have been already described (18). Animals were housed and treated in accordance with current National and European Union guidelines. Bone marrow-derived neutrophils (BMDN) were isolated from mouse femurs and tibias (12), whereas human neutrophils (>96.5%, as revealed by May-Grünwald-Giemsa staining) were isolated under endotoxin-free conditions from buffy coats of healthy donors (19). Immediately after purification, neutrophils from both species were suspended in RPMI 1640 medium supplemented with 10% heat-inactivated FBS (<9 pg/ml; Seromed, Biochrom, Berlin, Germany), stimulated, plated in 24-well tissue culture plates (Orange, Trasadingen, Switzerland) at 5 × 106/ml, and subsequently incubated at 37°C, 5% CO2 atmosphere. Neutrophils were usually stimulated with 50 nM CXCL1/MIP-2, 10 nM CXCL6/GCP-2 (PeproTech, Rocky Hill, NJ), 10 nM CXCL8/IL-8 (R&D Systems, Minneapolis, MN), or 50 ng/ml PMA (Sigma-Aldrich, St. Louis, MO), as indicated. In selected experiments, neutrophils were pretreated for 20 min with 10 μM PP2 (Calbiochem, San Diego, CA) before stimulation. After the indicated incubation period, cells were collected and centrifuged at 350 × g for 5 min. The resulting supernatants were immediately frozen in liquid nitrogen and stored at −70°C. Bone marrow-derived macrophages (BMDM) were also prepared (20) and stimulated as described above, for comparison. All reagents used were of the highest available grade and were dissolved in pyrogen-free water for clinical use (19). Neutrophil migration was assessed using 3-μm pore size Transwells (Costar-Nucleopore, Milan, Italy) precoated with FBS (for the chemotaxis assay) or with Matrigel (20 μg/filter, for the chemoinvasion assay) (21). BMDNs, immediately after purification, were suspended in serum free RPMI 1640 medium at 5 × 106/ml. A total of 100 μl of cell suspension was added to the top well, and 600 μl of medium, with or without 1 nM CXCL1/MIP-2, were added to the bottom well. Chemotaxis and chemoinvasion assays were run in parallel to verify that the Matrigel concentration was sufficient to act as a true barrier against cell migration. Each point was run in triplicate. The chambers were incubated for 1 h at 37°C in 5% CO2 humidified atmosphere. After centrifugation of the plate at 350 × g for 10 min, the Transwells were removed and the cells migrated quantified as previously described (22). Antigenic VEGF-A and MMP-9 were measured in cell-free supernatants by using specific ELISAs (R&D Systems) with detection limits of 10 pg/ml for VEGF-A and 70 pg/ml for MMP-9. Determination of lactoferrin release was performed by ELISA as previously described (13). The s.c. Matrigel sponge model of angiogenesis in vivo was used (23). Briefly, liquid Matrigel containing heparin (26 U/ml; Schwarz Pharma, San Grato-Lodi, Italy) was mixed at 4°C with or without proangiogenic agonists, including a potent angiogenic mixture consisting of human or murine VEGF-A (60 ng/ml) plus murine TNF-α (2 ng/ml; PeproTech; VEGF-A/TNF-α/heparin (VTH), 2 ng/ml TNF-α, or either 80 ng/ml CXCL1/MIP-2 or 80 ng/ml CXCL1/KC (R&D Systems), and then diluted to a final volume of 0.6 ml. In some experiments, 16 ng/ml neutralizing anti-VEG-A Abs (either goat anti-murine VEGF-A or murine anti-human VEGF-A Abs) or isotype-matched control IgG (R&D Systems) were included in the Matrigel suspension. After 4 days, gels were collected, weighed, and subjected to analysis of hemoglobin content as an estimate of vascularization (23). Some samples were formalin-fixed, paraffin-embedded, sectioned at 2–4 μm, and then stained with H&E for histological analysis or with anti-myeloperoxidase (DAKO, Glostrup, Denmark) or anti-mouse F4/80 (Ly-71) Ag (clone CI: A3-1; Caltag Laboratories, Burlingame, CA) Abs for immunohistochemistry. Angiogenesis by CAM assay was performed using fertilized White Leghorn chick eggs, as already described (24). At day 9, 1 mm3sterilized gelatin sponges (Gelfoam; Upjohn, Kalamazoo, MI) adsorbed with vehicle (negative control), anti-VEGF-A Abs, CXCL1/MIP-2, or both (all at 200 ng per embryo and dissolved in 4 μl of 0.1% BSA in PBS) were implanted on the top of growing CAMs (25). CAMs were examined under a stereomicroscope and blood vessels around the sponges were counted at day 11 (24). BMDN were resuspended in HBSS containing 0.5 mM CaCl2 and 5 mM D-glucose, and stimulated for the times indicated with 50 nM CXCL1/MIP-2 at 37°C. The reaction was blocked by adding ice-cold HBSS containing 1 mM Na3VO4, 2 mM EDTA, 5 mM EGTA, 5 mM NaF, 10 μg/ml aprotinin, 5 μg/ml leupeptin, 5 μg/ml pepstatin A, 1 mM PMSF, and 1 mM DFP. After 10 min, cells were lysed by adding 4-fold concentrated RIPA for 20 min and centrifuged (14,000 × g, 15 min) to remove cell debris. Hck and Fgr were immunoprecipitated from 150 μg of cell lysates using Abs bound to protein A immobilized to Trysacryl (Sigma-Aldrich) and then processed for the in vitro autophosphorylation assay, as previously described (20). Samples were first electrophoresed on 10% SDS-PAGE and then transfered to nitrocellulose. Blots were initially processed for autoradiography by exposure to X-Omat AR films (Kodak, Rochester, NY), and then subjected to Western analysis, as previously described (26). Data are expressed as means ± SEM. Statistical analyses were performed by Student’s t test. Values of p < 0.05 were considered significant. Addition of CXCL1/MIP-2 to the Matrigel sponges s.c. injected in wild-type mice resulted in an intense vascularization of the gels (Fig. 1⇓), as previously described (10). The intensity of the angiogenic response to CXCL1/MIP-2, as estimated by the hemoglobin content, was comparable to that induced by VTH, a mixture containing TNF-α, which increases the expression of VEGFR2 on endothelial cells (27), and VEGF-A, a potent angiogenic factor acting directly on endothelial cells (Fig. 1⇓). As expected, TNF-α-treated (Fig. 1⇓) or control Matrigel pellets (containing only heparin, see Materials and Methods) (not shown) showed essentially undetectable vascularization, indicating that VEGF-A was the key factor implicated in VTH-induced angiogenesis. A strong angiogenic response to CXCL1/MIP-2 was also observed in either hck−/− or fgr−/− mice (data not shown). In contrast to wild-type and single-knockout animals, hck−/−fgr−/− mice showed little angiogenesis induced by CXCL1/MIP-2 (Fig. 1⇓). 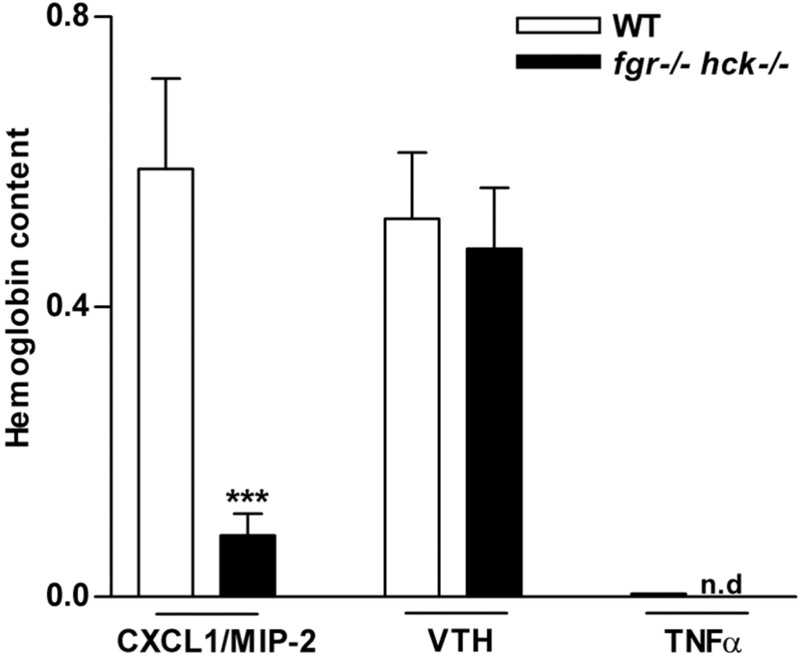 However, the hck−/−fgr−/− animals had normal angiogenic responses to VTH (Fig. 1⇓), demonstrating intact endothelial cell function. These data clearly show that the angiogenic response to CXCL1/MIP-2, but not direct endothelial cell stimulations, is specifically altered in hck−/−fgr−/− mice. Absence of CXCL1/MIP-2-induced angiogenic response in hck−/−fgr−/− mice. Matrigel sponges containing either 80 ng/ml CXCL1/MIP-2, 2 ng/ml TNF-α and 60 ng/ml VEGF-A (VTH), or 2 ng/ml TNF-α alone were s.c. injected into the flanks of wild-type or hck−/−fgr−/− mice. The extent of neovascularization was evaluated by measurement of hemoglobin content in the Matrigel implants at day 4. Means ± SEM, pooled from four independent experiments are shown. The asterisks indicate a significant inhibition of CXCL1/MIP-2 induced angiogenesis in hck−/−fgr−/− mice; ∗∗∗, p < 0,001 (Student’s t test). ND, Not done. We then examined whether the observed lack of angiogenic response in the hck−/−fgr−/− mice upon CXCL1/MIP-2 treatment was due to an impaired neutrophil recruitment. Immunohistochemical examination of the Matrigel pellets in both wild-type and hck−/−fgr−/− mice showed the presence of a significant number of myeloperoxidase-positive cells (Fig. 2⇓A), suggesting that src-kinase-deficient leukocytes were efficiently migrating and invading toward CXCL1/MIP-2 in vivo. In contrast, there was a scarce to absent myeloperoxidase-positive infiltrate in the Matrigel sponges containing VTH and implanted either in wild-type or hck−/−fgr−/− mice (Fig. 2⇓A), which showed a strong angiogenic response. Histological examination confirmed that CXCL1/MIP-2 (Fig. 2⇓B, left panels), but not VTH, induced a substantial neutrophil recruitment and infiltration of the Matrigel sponge in both wild-type and hck−/−fgr−/− mice (indicated by arrows). Furthermore, examination with anti-F4/80 Abs revealed that F4/80+ mononuclear cells moderately penetrated the Matrigel sponges in response to either CXCL1/MIP-2 or VTH, with no appreciable differences between wild-type and hck−/−fgr−/− mice (Fig. 2⇓B, right panels). These data indicate that neutrophils represented the majority of the myeloperoxidase-positive infiltrate observed in CXCL1/MIP-2-treated mice. 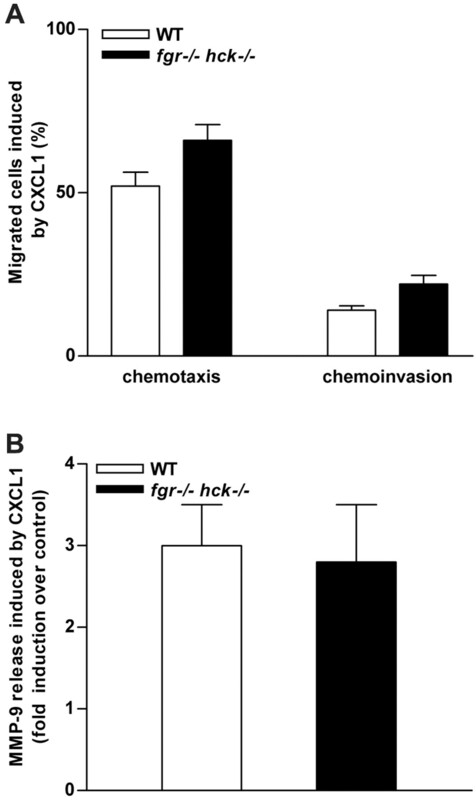 In keeping with these findings, neutrophils isolated from both wild-type and hck−/−fgr−/− mice migrated equally well toward CXCL1/MIP-2 gradients in vitro, as determined by both a chemotaxis and a chemoinvasion assay (Fig. 3⇓A). Importantly, the capacity to release MMP-9, which is a critical function for cells invading across Matrigel barriers (21), was also not altered in hck−/−fgr−/− neutrophils stimulated with CXCL1/MIP-2 (Fig. 3⇓B). Collectively, these results suggested that, while recruitment of hck−/−fgr−/− neutrophils to the site of the angiogenic response is normal, other biological defects, present in hck−/−fgr−/− mice, were responsible for the defective engagement of the CXCL1/MIP-2-stimulated angiogenic cascade. Histology and immunohistochemistry of CXCL1/MIP-2- or VTH-containing Matrigel pellets implanted in wild-type and hck−/−fgr−/− mice. Matrigel pellets containing 80 ng/ml CXCL1/MIP-2 and VTH implanted in wild-type and hck−/−fgr−/− mice were stained with anti-myeloperoxidase Abs (×400) (A) and H&E (B, left panels) and anti-F4/80 (Ly-71) Abs (B, right panels; ×630). Neutrophils isolated from hck−/−fgr−/− mice efficiently migrate and release MMP-9 in response to CXCL1/MIP-2. A, Chemotaxis and chemoinvasion of neutrophils isolated from both wild-type and hck−/−fgr−/− mice in response to 1 nM CXCL1/MIP-2. Values are expressed as means ± SEM of triplicate determinations calculated from three independent experiments and are expressed as the percentage of total cells that migrated. Migration and chemoinvasion of unstimulated neutrophils was undetectable. B, Wild-type and hck−/−fgr−/− neutrophils were cultured for 2 h with or without 50 nM CXCL1/MIP-2 before determining MMP-9 in the corresponding supernatants. Bars indicate the fold induction of MMP-9 release induced by CXCL1/MIP-2 over unstimulated cells and are expressed as means ± SEM calculated from duplicate determinations of three independent experiments. Since both human and murine neutrophils are known to produce biologically active VEGF-A (6, 7, 28) and CXCL8/IL-8 has recently been reported to induce the secretion of VEGF-A by human neutrophils (29), we examined whether neutrophils from wild-type and hck−/−fgr−/− animals could release VEGF-A upon stimulation with CXCL1/MIP-2. As shown in Fig. 4⇓A, incubation of wild-type neutrophils with CXCL1/MIP-2 resulted in a remarkable release of VEGF-A as compared with resting cells. In contrast, neutrophils from hck−/−fgr−/− mice were unable to release VEGF-A upon CXCL1/MIP-2-stimulation (Fig. 4⇓A). Lactoferrin release by CXCL1/MIP-2-stimulated neutrophils of hck−/−fgr −/− animals was also greatly impaired (Fig. 4⇓B), in agreement with similar findings obtained with other agonists (13, 14). However, both wild-type and hck−/−fgr−/− cells released similar levels of both VEGF-A and lactoferrin in response to PMA (Fig. 4⇓A), indicating that the lack of VEGF-A release upon CXCL1/MIP-2-stimulation cannot be attributed to a general defect of hck−/−fgr−/− neutrophils to degranulate. Experiments performed with PP2, a specific inhibitor of the src kinases (30), confirmed that interruption of src kinase activation after CXCL1/MIP-2-stimulation prevented the release of VEGF-A. Treatment with PP2, in fact, fully blocked the release of VEGF-A by both CXCL1/MIP-2-stimulated murine neutrophils and CXCL8/IL-8-/CXCL6-/GCP-2-stimulated human neutrophils (Fig. 4⇓C). Under these same conditions, the capacity of PMA to stimulate the release of VEGF-A by both human or murine neutrophils (Fig. 4⇓C), as well as the release of MMP-9 by CXCL1/MIP-2-stimulated neutrophils (data not shown), was not affected by PP2, thus excluding any aspecific toxicity of PP2. CXCL1/MIP-2 fails to induce the release of VEGF-A by neutrophils isolated from hck−/−fgr−/− mice. Wild-type and hck−/−fgr−/− neutrophils were cultured for 21 h with 50 nM CXCL1/MIP-2 or 50 ng/ml PMA. Cell-free supernatants were then harvested and quantified for VEGF-A (A) and lactoferrin (B) content by ELISA. Values represent the means ± SEM of duplicated determinations calculated from six independent experiments. C, Neutrophils isolated from wild-type mice or neutrophils from human donors were pretreated for 20 min at 37°C with or without 10 μM PP2 and then stimulated with either 50 nM CXCL-1/MIP-2, 10 nM CXCL8/IL-8, 10 nM CXCL6/G-CP2, or 50 ng/ml PMA as indicated. After incubation for 21 h, cell-free supernatants were harvested and processed for VEGF-A measurement. Bars indicate the inhibitory effect of PP2 (in percentage) on agonist-induced VEGF-A released expressed as means ± SEM (n = 3). 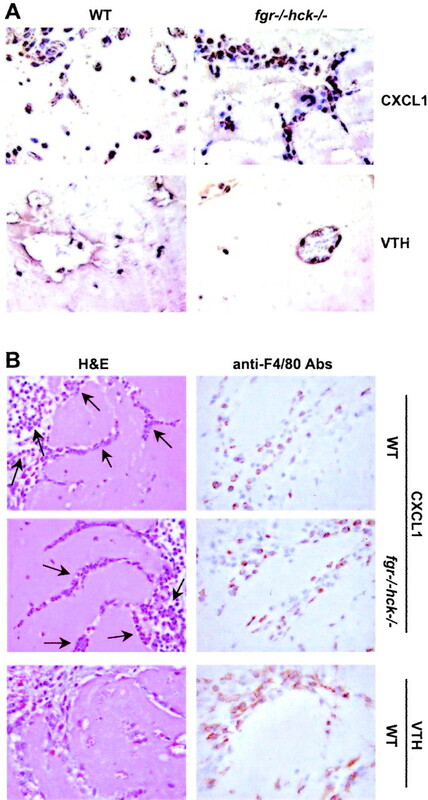 The above findings suggested that the defective angiogenic response to CXCL1/MIP-2 in hck−/−fgr−/− mice could be due to their inability of CXCL1/MIP-2-recruited neutrophils to release VEGF-A. To unequivocally demonstrate this, we tested the ability of blocking anti-VEGF-A Abs to interfere with the angiogenesis induced by either CXCL1/MIP-2 or VTH (as a positive control) in the Matrigel sponge model in wild-type mice. 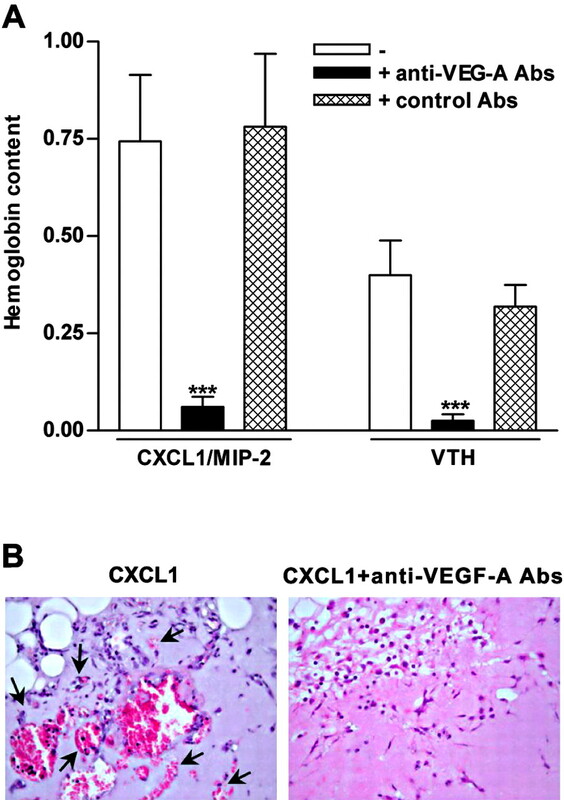 The anti-VEGF-A Abs, but not isotype-matched control Abs, completely suppressed both CXCL1/MIP-2- and VTH-induced neovascularization of the gels (Fig. 5⇓A). Histological examination of the Matrigel pellets confirmed that the cellular infiltrates in pellets containing CXCL1/MIP-2 in the presence or absence of anti-VEGF-A Abs were essentially similar (Fig. 5⇓B), indicating that the anti-VEGF-A Abs were blocking the extensive angiogenesis (indicated by arrows) induced by the chemokine, without interfering with chemokine-mediated neutrophil recruitment. Similar results were obtained by using a different angiogenesis assay, the chick embryo CAM assay (Fig. 6⇓). In the latter, not only did CXCL1/MIP-2 induce a significant angiogenic response, but this response was fully abolished by neutralizing anti-VEGF-A Abs. No effect was instead exerted by the anti-VEGF-A Abs on vehicle control CAMs (Fig. 6⇓). 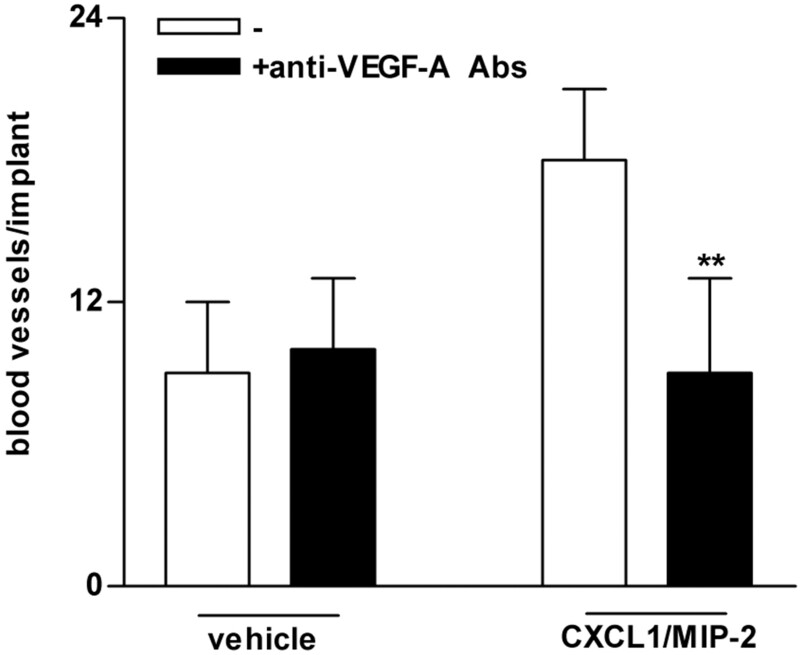 Effect of neutralizing Abs to VEGF-A on CXCL1/MIP-2-induced angiogenesis. A, Matrigel sponges containing either 80 ng/ml CXCL1/MIP-2 or VTH, in the presence or absence of 16 ng/ml anti-VEGF-A Abs or isotype-matched goat IgG, as indicated, were s.c. injected into the flanks of wild-type mice. The extent of neovascularization was evaluated by measurement of hemoglobin content in the Matrigel implants at day 4. The data were pooled from three independent experiments; means ± SEM are shown. The asterisks indicate a significant inhibition of CXCL1/MIP-2-induced angiogenesis by neutralizing Abs to VEGF-A: ∗∗∗, p < 0.001 (Student’s t test). B, Histological analyses of the Matrigel pellets performed with H&E (×400). Effect of neutralizing anti-VEGF-A Ab on CXCL1/MIP-2-induced neovascularization of the CAM. Chick embryo CAMs were implanted with gelatin sponges treated with anti-VEGF-A Abs, CXCL1/MIP-2, or both (all at 200 ng per embryo) at day 9 of development. At day 11, macroscopic blood vessels infiltrating the sponge were counted under a stereomicroscope. Data are the mean ± SD. ∗∗, Statistically different from CXCL1/MIP-2, (p < 0.01, Student’s t test). The data presented here suggest that CXCL1/MIP-2 activates Hck and Fgr. This was definitively demonstrated with immunocomplex kinase assays using Abs that specifically recognize Hck and Fgr. Treatment of murine neutrophils with CXCL1/MIP-2 resulted in a time dependent enhancement of the autophosphorylating activity of both Hck and Fgr (Fig. 7⇓). 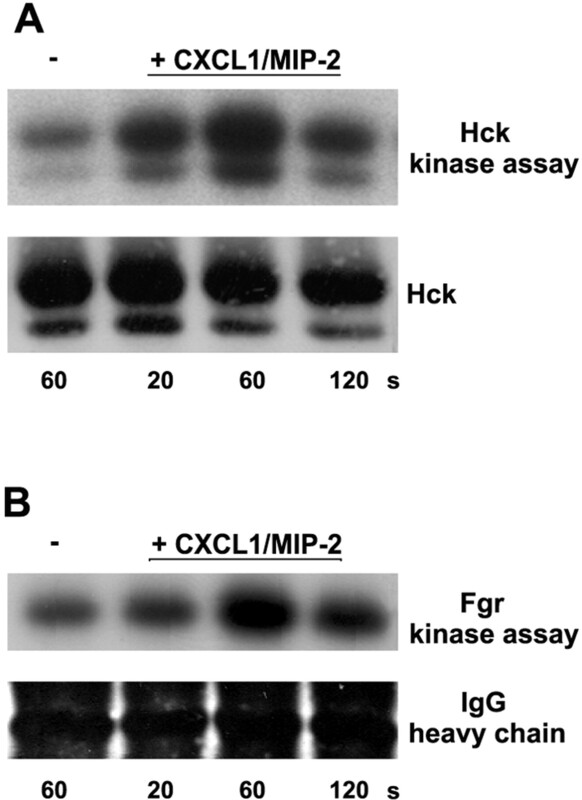 Activation of Fgr and Hck kinases by CXCL1/MIP-2 in BMDN. Wild-type BMDN were stimulated with 50 nM CXCL1/MIP-2 at 37°C for the times indicated. Protein extracts were immunoprecipitated with rabbit anti-Hck (A, upper panel) and anti-Fgr (B, upper panel) Abs for in vitro autophosphorylation, as described in Materials and Methods. After the decay of the radioactivity, the blot was incubated with goat anti-Hck (A, lower panel) and rabbit anti-Fgr (B, lower panel) Abs to verify equal protein amount in the immunoprecipitate. Detection of the Fgr protein in the immunoprecipitate was not possible due to its comigration with the rabbit IgG H chain. We have recently reported that the angiogenic activity of CXC-ELR+ chemokines in the Matrigel plug angiogenesis assay in vivo is neutrophil-dependent, as neutrophil depletion of the animals completely abrogated the angiogenic response to these agonists (10). In this study, we have identified a mechanism through which neutrophils exert this specific activity. Our data indicates that stimulation of neutrophils with CXCL1/MIP-2 leads to their recruitment and release of biologically active VEGF-A that in turn initiates an angiogenic cascade within the affected tissue. The availability of hck−/−fgr−/− mice offered an appropriate experimental model to understand how neutrophils mediate neovascularization in response to CXCL1/MIP-2. These mice were chosen because their neutrophils exhibit compromised effector functions under specific experimental conditions and, at least in the endotoxic shock model, were shown to display a reduced migration into inflamed tissues (12, 13, 14, 15). Indeed, we observed that hck−/−fgr−/− mice were unable to mount an angiogenic response to CXCL1/MIP-2, while retaining fully responsiveness to VEGF-A, confirming normal endothelial function in these animals. These results are in agreement with the observation that neutrophils play a major role in mediating the angiogenic response to CXC-ELR+ chemokines (10), but not to VEGF-A (this paper) or basic fibroblast growth factor (31), which are direct endothelial cell motogens and mitogens. Histological examination of the CXCL1/MIP-2-containing Matrigel implants isolated from the hck−/−fgr−/− mice showed a neutrophil infiltrate similar in extent to those found in wild-type mice, excluding that the absence of angiogenesis in response to CXCL1/MIP-2 was a consequence of defective recruitment of neutrophils. Indeed, in vitro assays confirmed that neutrophils from hck−/−fgr−/− mice were fully capable of both chemotactic and chemoinvasion activities and to release gelatinase B (MMP-9) in response to CXCL1/MIP-2. These results are in line with other studies performed in hck−/−fgr−/−lyn−/− neutrophils, which were found to be chemotactic to a similar extent as wild-type cells in in vitro assays and to accumulate normally in the peritoneal cavity in an in vivo model of thioglycollate-induced peritonitis (32). To identify putative biological defect/s that could be eventually responsible for the impaired angiogenic response to CXCL1/MIP-2 observed in hck−/−fgr−/− animals, we explored whether hck−/−fgr−/− neutrophils were able to release VEGF-A upon stimulation with CXCL1/MIP-2. Our data clearly showed that, unlike normal cells, neutrophils from hck−/−fgr−/− mice did not release VEGF-A when incubated with CXCL1/MIP-2, whereas they normally responded to PMA. In addition, we also observed that the specific src kinase inhibitor, PP2, completely blocked the capacity of human or murine neutrophils to release VEGF-A after stimulation with human CXCL8/IL-8 and CXCL6/GCP-2, or murine CXCL1/MIP-2, respectively. Further, PP2 did not alter VEGF-A release induced by PMA, supporting the notion that Hck and Fgr are involved in the signaling pathway controlling VEGF-A release by CXC-ELR+ chemokines. It was beyond the scope of this report to investigate how these src kinases control VEGF-A secretion. However, it has been previously shown that human neutrophils harbor, in their secondary granules, an intracellular pool of VEGF-A that can be readily released in response to appropriate stimuli (6, 7). It is important to note that both Fgr (33) and Hck (34) were found to localize to neutrophil granules and translocate to the plasma membrane upon stimulation with chemoattractants, suggesting their possible role in regulating degranulation. Indeed, hck−/−fgr−/− and hck−/−fgr−/−lyn−/− neutrophils have been shown to be defective in release of the secondary granule marker lactoferrin (13, 14), as confirmed here. Finally, we demonstrate that CXCL1/MIP-2 stimulation of murine neutrophils results in autophosphorylation of both Hck and Fgr, further suggesting that these signal transduction molecules are involved in controlling VEGF-A release. Our demonstration that neutralizing anti-VEGF-A Abs completely inhibited the angiogenic response to CXCL1/MIP-2 in wild-type animals represents a convincing indication that the inability of hck−/−fgr−/− neutrophils to release VEGF-A in response to CXCL1/MIP-2 is critical for the lack of angiogenesis in the Matrigel implants. We cannot exclude that other alterations of hck−/−fgr−/− neutrophils could contribute to the defective angiogenic response to CXCL1/MIP-2. For instance, it is important to note that defects related to the production of reactive oxygen intermediates (12) may also contribute to inhibition of the angiogenic response. However, the finding that CXCL1/MIP-2 promoted new vessel formation in a VEGF-A-dependent manner in another angiogenesis assay, CAM, further support the importance of this mechanism in neutrophil-mediated neovascularization. Finally, additional findings (our unpublished observations) suggest that the release of VEGF-A by recruited neutrophils might be a fundamental step not only for CXCL-1/MIP-2-induced angiogenesis, but, in general, for CXC-ELR+ chemokines-induced angiogenesis. Accordingly, we found that the angiogenic response to CXCL1/KC is also defective in hck−/−fgr−/− mice, and have also observed that CXCL1/KC-induced angiogenesis was completely inhibited by anti-VEGF-A Abs. In addition, the src kinase-dependent, CXCL1/MIP-2-induced angiogenic response described in this report appears to be independent of mononuclear phagocytes. This is supported by the observation that with immunohistochemical staining, we noted relatively few monocytes/macrophages infiltrating into the Matrigel implants both in wild-type and hck−/−fgr−/− animals, either in the presence of CXCL1/MIP-2 or VEGF-A containing pellets. Furthermore, at least in vitro, mononuclear phagocytes failed to produce VEGF-A in response to CXCL1/MIP-2 (P. Scapini and M. A. Cassatella, unpublished observations). Collectively, the data presented in this study confirm that neutrophils play a key role in the angiogenic process induced by CXC-ELR+ chemokines, at least in these models. Indeed, a direct activation of endothelial cells by CXCL1/MIP-2 does not seem to be involved in the angiogenic process induced by this ligand, as demonstrated by the experiments with anti-VEGF-A Abs performed in wild-type mice and in the CAM assay. In addition, not only appear the Fgr and Hck kinases selectively expressed in myeloid cells (18) and not in endothelial cells, but a src pathway impairment at the endothelial cell level would have inhibited the angiogenic response to VEGF-A, since the activity of src kinases has been previously shown to be fundamental for the VEGF-A-induced neovascularization (35). In contrast with our findings, other studies reported that in the corneal micropocket assay, the angiogenic response to CXC-ELR+ chemokines occurs in the absence of neutrophil inflammation, thus pointing to a possible direct interaction of these ligands with endothelial cells (2, 3). These contrasting results might be due to inherent differences in the two models, particularly in light of the immune privilege of ocular tissues (36). However, in a typical inflammatory model of cornea neovascularization, like that induced in response to Pseudomonas aeruginosa infection, the resulting angiogenic response was shown to be associated with neutrophil infiltration and dependent on CXCL1/MIP-2 and VEGF-A production (37). CXC-ELR+ chemokines are known to be strongly up-regulated during inflammatory or neoplastic conditions, which are pathological processes in which neutrophils, particularly at their initial stages, may represent a prominent cellular component (38). Our data suggest that, in contrast to current dogma, neutrophils might represent the first and major sources of VEGF-A in such pathological events and, as a consequence, would most likely contribute to and facilitate the dysregulated angiogenic response to CXC-ELR+ chemokines that often develop under these conditions. We thank Prof. Marco Presta for his inestimable help and suggestions. ↵1 This work was supported by grants from Ministero dell’Istruzione, dell’Università e della Ricerca (COFIN, Fondo per la Incentivazione della Ricerca di Base, and 60%), Ministero della Salute (Progetto Finalizzato), Istituto Superiore di Sanità (Progetto AIDS and Progetto Italia-USA sulla Terapia dei Tumori), Associazione Italiana per la Ricerca sul Cancro, CARIVERONA-2001, and Compagnia di San Paolo. P.S. is a recipient of a fellowship from the Fondazione Italiana per la Ricerca sul Cancro. ↵2 P.S. and M.M. contributed equally to this work. ↵4 Abbreviations used in this paper: GRO, growth-related oncogene; GCP-2, granulocyte chemotactic protein-2; CXCL1/MIP-2, CXCL1/macrophage inflammatory protein-2; VEGF-A, vascular endothelial growth factor-A; CAM, chorioallantoic membrane; BMDN, bone marrow-derived neutrophil; BMDM, bone marrow-derived macrophage; MMP-9, matrix metalloproteinase 9; VTH, VEGF-A/TNF-α/heparin. Carmeliet, P., R. K. Jain. 2000. Angiogenesis in cancer and other diseases. Nature 407:249. Belperio, J. A., M. P. Keane, D. A. Arenberg, C. L. Addison, J. E. Ehlert, M. D. Burdick, R. M. Strieter. 2000. CXC chemokines in angiogenesis. J. Leukocyte Biol. 68:1. Addison, C. L., T. O. Daniel, M. D. Burdick, H. Liu, J. E. Ehlert, Y. Y. Xue, L. Buechi, A. Walz, A. Richmond, R. M. Strieter. 2000. The CXC chemokine receptor 2, CXCR2, is the putative receptor for ELR+ CXC chemokine-induced angiogenic activity. J. Immunol. 165:5269. Baggiolini, M.. 1995. Activation and recruitment of neutrophil leukocytes. Clin. Exp. Immunol. 101:5. Cassatella, M. A.. 1999. Neutrophil-derived proteins: selling cytokines by the pound. Adv. Immunol. 73:369. Gaudry, M., O. Bregerie, V. Andrieu, J. El Benna, M. A. Pocidalo, J. Hakim. 1997. Intracellular pool of vascular endothelial growth factor in human neutrophils. Blood 90:4153. Scapini, P., F. Calzetti, M. A. Cassatella. 1999. On the detection of neutrophil-derived vascular endothelial growth factor (VEGF). J. Immunol. Methods 232:121. Sakaguchi, H., S. Seki, H. Tsubouchi, Y. Daikuhara, Y. Niitani, K. Kobayashi. 1994. Ultrastructural location of human hepatocyte growth factor in human liver. Hepatology 19:1157. McCourt, M., J. H. Wang, S. Sookhai, H. P. Redmond. 2001. Activated human neutrophils release hepatocyte growth factor/scatter factor. Eur. J. Surg. Oncol. 27:396. Benelli, R., M. Morini, F. Carrozzino, N. Ferrari, S. Minghelli, L. Santi, M. Cassatella, D. M. Noonan, A. Albini. 2002. Neutrophils as a key cellular target for angiostatin: implications for regulation of angiogenesis and inflammation. FASEB J. 16:267. Lowell, C. A., G. Berton. 1999. Integrin signal transduction in myeloid leukocytes. J. Leukocyte Biol. 65:313. Lowell, C. A., L. Fumagalli, G. Berton. 1996. Deficiency of Src family kinases p59/61hck and p58c-fgr results in defective adhesion-dependent neutrophil functions. J. Cell Biol. 133:895. Mocsai, A., E. Ligeti, C. A. Lowell, G. Berton. 1999. Adhesion-dependent degranulation of neutrophils requires the Src family kinases Fgr and Hck. J. Immunol. 162:1120. Mocsai, A., Z. Jakus, T. Vantus, G. Berton, C. A. Lowell, E. Ligeti. 2000. Kinase pathways in chemoattractant-induced degranulation of neutrophils: the role of p38 mitogen-activated protein kinase activated by Src family kinases. J. Immunol. 164:4321. Lowell, C. A., G. Berton. 1998. Resistance to endotoxic shock and reduced neutrophil migration in mice deficient for the Src-family kinases Hck and Fgr. Proc. Natl. Acad. Sci. USA 95:7580. Vicentini, L., P. Mazzi, E. Caveggion, S. Continolo, L. Fumagalli, J. A. Lapinet-Vera, C. A. Lowell, G. Berton. 2002. Fgr deficiency results in defective eosinophil recruitment to the lung during allergic airway inflammation. J. Immunol. 168:6446. Barlic, J., J. D. Andrews, A. A. Kelvin, S. E. Bosinger, M. E. DeVries, L. Xu, T. Dobransky, R. D. Feldman, S. S. Ferguson, D. J. Kelvin. 2000. Regulation of tyrosine kinase activation and granule release through β-arrestin by CXCRI. Nat. Immunol. 1:227. Lowell, C. A., P. Soriano, H. E. Varmus. 1994. Functional overlap in the src gene family: inactivation of hck and fgr impairs natural immunity. Genes Dev. 8:387. Cassatella, M. A., F. Bazzoni, R. M. Flynn, S. Dusi, G. Trinchieri, F. Rossi. 1990. Molecular basis of interferon-γ and lipopolysaccharide enhancement of phagocyte respiratory burst capability: studies on the gene expression of several NADPH oxidase components. J. Biol. Chem. 265:20241. Suen, P. W., D. Ilic, E. Caveggion, G. Berton, C. H. Damsky, C. A. Lowell. 1999. Impaired integrin-mediated signal transduction, altered cytoskeletal structure, and reduced motility in Hck/Fgr deficient macrophages. J. Cell Sci. 112:4067. Benelli, R., A. Albini. 1999. In vitro models of angiogenesis: the use of Matrigel. Int. J. Biol. Markers 14:243. Bellavite, P., S. Chirumbolo, C. Mansoldo, G. Gandini, P. Dri. 1992. Simultaneous assay for oxidative metabolism and adhesion of human neutrophils: evidence for correlations and dissociations of the two responses. J. Leukocyte Biol. 51:329. Albini, A., G. Fontanini, L. Masiello, C. Tacchetti, D. Bigini, P. Luzzi, D. M. Noonan, W. G. Stetler-Stevenson. 1994. Angiogenic potential in vivo by Kaposi’s sarcoma cell-free supernatants and HIV-1 tat product: inhibition of KS-like lesions by tissue inhibitor of metalloproteinase-2. AIDS 8:1237. Scapini, P., L. Nesi, M. Morini, E. Tanghetti, M. Belleri, D. Noonan, M. Presta, A. Albini, M. A. Cassatella. 2002. Generation of biologically active angiostatin kringle 1–3 by activated human neutrophils. J. Immunol. 168:5798. Ribatti, D., A. Gualandris, M. Bastaki, A. Vacca, M. Iurlaro, L. Roncali, M. Presta. 1997. New model for the study of angiogenesis and antiangiogenesis in the chick embryo chorioallantoic membrane: the gelatin sponge/chorioallantoic membrane assay. J. Vasc. Res. 34:455. Caveggion, E., S. Continolo, F. J. Pixley, E. R. Stanley, D. D. Bowtell, C. A. Lowell, G. Berton. 2003. Expression and tyrosine phosphorylation of Cbl regulates macrophage chemokinetic and chemotactic movement. J. Cell Physiol. 195:276. Giraudo, E., L. Primo, E. Audero, H. P. Gerber, P. Koolwijk, S. Soker, M. Klagsbrun, N. Ferrara, F. Bussolino. 1998. Tumor necrosis factor-α regulates expression of vascular endothelial growth factor receptor-2 and of its co-receptor neuropilin-1 in human vascular endothelial cells. J. Biol. Chem. 273:22128. Sakaguchi, I., N. Ikeda, M. Nakayama, Y. Kato, I. Yano, K. Kaneda. 2000. Trehalose 6,6′-dimycolate (Cord factor) enhances neovascularization through vascular endothelial growth factor production by neutrophils and macrophages. Infect. Immun. 68:2043. Cullen, V. C., A. J. Mackarel, S. J. Hislip, C. M. O’Connor, A. K. Keenan. 2000. Investigation of vascular endothelial growth factor effects on pulmonary endothelial monolayer permeability and neutrophil transmigration. Gen. Pharmacol. 35:149. Hanke, J. H., J. P. Gardner, R. L. Dow, P. S. Changelian, W. H. Brissette, E. J. Weringer, B. A. Pollok, P. A. Connelly. 1996. Discovery of a novel, potent, and Src family selective tyrosine kinase inhibitor: study of Lck- and FynT-dependent T cell activation. J. Biol. Chem. 271:695. Kibbey, M. C., D. S. Grant, H. K. Kleinman. 1992. Role of the SIKVAV site of laminin in promotion of angiogenesis and tumor growth: an in vivo Matrigel model. J. Natl. Cancer Inst. 84:1633. Mocsai, A., M. Zhou, F. Meng, V. L. Tybulewicz, C. A. Lowell. 2002. Syk is required for integrin signaling in neutrophils. Immunity 16:547. Gutkind, J. S., K. C. Robbins. 1989. Translocation of the FGR protein-tyrosine kinase as a consequence of neutrophil activation. Proc. Natl. Acad. Sci. USA 86:8783. Mohn, H., V. Le Cabec, S. Fischer, I. Maridonneau-Parini. 1995. The src-family protein-tyrosine kinase p59hck is located on the secretory granules in human neutrophils and translocates towards the phagosome during cell activation. Biochem. J. 309:657. Eliceiri, B. P., R. Paul, P. L. Schwartzberg, J. D. Hood, J. Leng, D. A. Cheresh. 1999. Selective requirement for Src kinases during VEGF-induced angiogenesis and vascular permeability. Mol. Cell. 4:915. Benelli, R., A. Albini, D. Noonan. 2003. Neutrophils and angiogenesis: potential initiators of the angiogenic cascade. Chem. Immunol. Allergy. 83:167. Xue, M. L., A. Thakur, M. Willcox. 2002. Macrophage inflammatory protein-2 and vascular endothelial growth factor regulate corneal neovascularization induced by infection with Pseudomonas aeruginosa in mice. Immunol. Cell Biol. 80:323. Bodolay, E., A. E. Koch, J. Kim, G. Szegedi, Z. Szekanecz. 2002. Angiogenesis and chemokines in rheumatoid arthritis and other systemic inflammatory rheumatic diseases. J. Cell Mol. Med. 6:357.